Infiniti today released a sketch of its first luxury electric vehicle, which is set to launch in the United States and other global markets in 2013. Befitting the brand's promise of "Inspired Performance," the Infiniti EV will be a stylish, high performance five-seat luxury vehicle with zero emissions technology. "This future EV will play a major part of Infiniti's 'eco performance' strategy that will see a greater focus on hybrid and EV technology," said Infiniti Vice President Ben Poore. "We are committed to applying the world's best technologies to reduce emissions without sacrificing driving excitement or engagement – a pledge that will become more evident soon with the upcoming introduction of our new Infiniti M Hybrid." 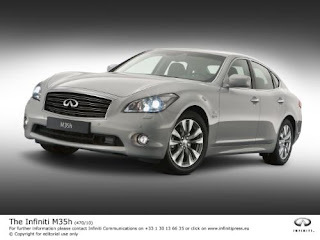 The 2012 Infiniti M35h, which features Infiniti's Direct Response Hybrid technology, makes its North American debut at the Los Angeles Auto Show in November. The M Hybrid is based on the popular Infiniti M sedan and promises V8 performance with 4-cylinder fuel economy from a 302-horsepower (est.) 3.5-liter V6 supported by a 50 kW (67 horsepower est.) electric motor. Dubbed "the driver's hybrid," the M35h will be able to be driven on electric power alone at speeds up to 50 miles per hour. The compact Lithium-ion battery pack design also allows use of a spacious passenger cabin and ample trunk capacity. "The new Infiniti M Hybrid changes the rules, achieving excellent fuel economy while delivering the exhilarating driving performance expected of a luxury sports sedan," added Poore. The Infiniti M35h will be available at Infiniti retailers in the United States in spring 2011.